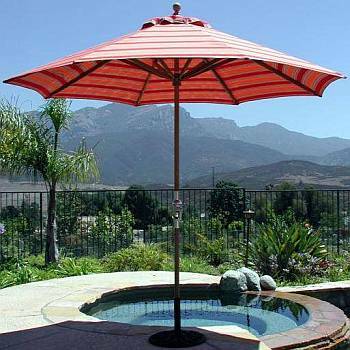 An umbrella adds needed shade to your patio, deck, pool side, or garden with a beautiful and practical patio or market umbrella. 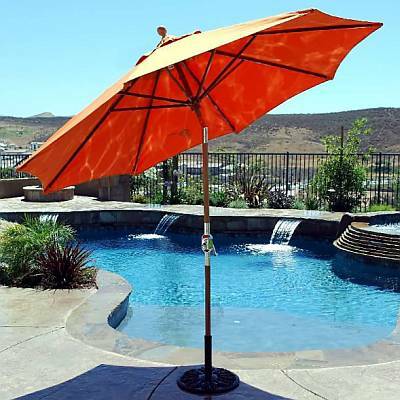 Even on the sunniest day, you can enjoy your outdoor living spaces and stay cooler in the shade of your umbrella. 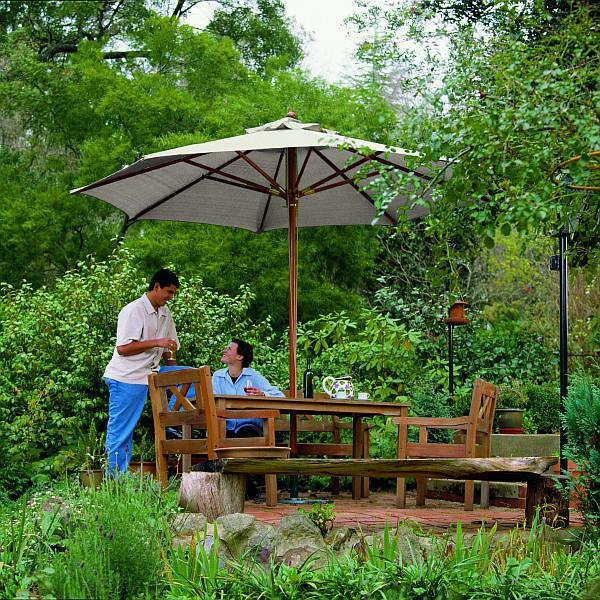 In addition, patio umbrellas are probably the best way to remain outside without absorbing the harmful UV rays of the sun, which cause skin cancers and sunburns. 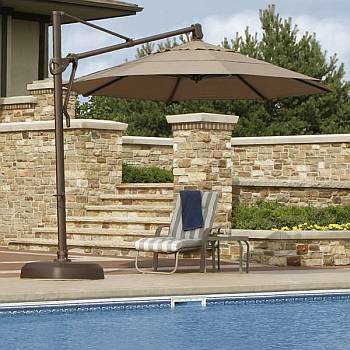 We offer only the best, time-proven Patio & Market Umbrellas at discounted prices for savvy Internet buyers. 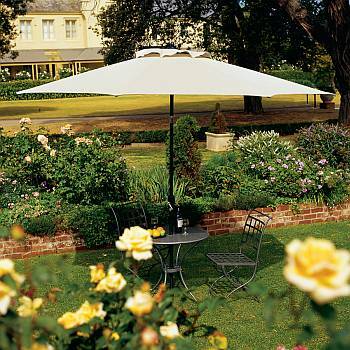 Our umbrellas were selected for their high quality, design, reliability, warranty, and value. 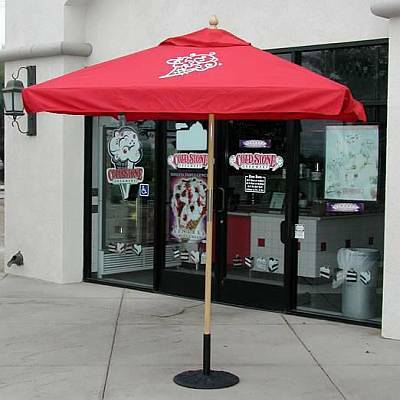 We have canvas and Sunbrella umbrellas in addition to side post umbrellas with various types of canopies, and much more. 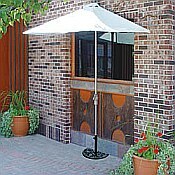 Standard pole patio umbrellas feature a long pole holding up the canopy from the center. 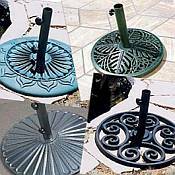 They are usually placed in a hole in patio table and/or in heavy bases. Canopy shapes of square, hexagon or octagon are most common. The hexagon/octagon shape are typically known as round. 6ft, 7ft, 7.5ft 9ft and 11ft and the standardized sizes though many manufacturers will entertain making a custom size with a large quantity order. 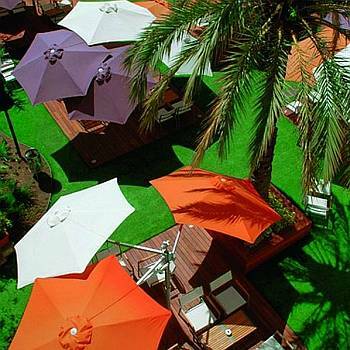 These outdoor umbrellas feature a pole with the canopy that opens to its side. The canopy collapses/closes next to the pole in most cases. These are usually used in seating areas where there isnt a table to help support it. Some are wall mounted. 8ft, 10ft, 11ft and 13ft squares or hexagon shaped canopies are most common. 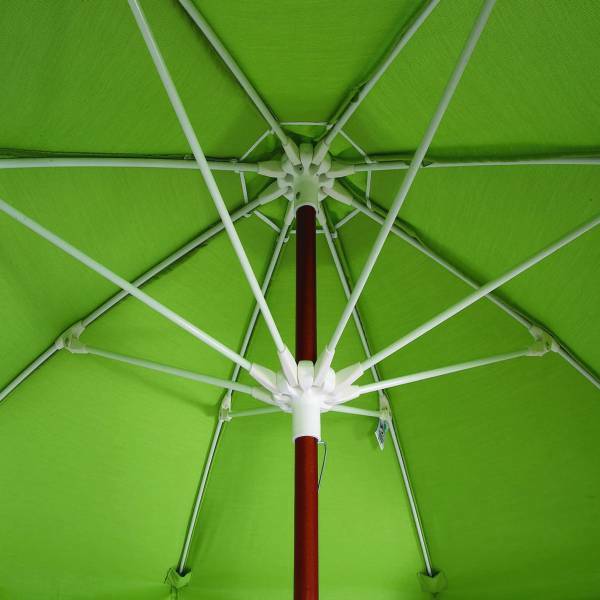 Outdoor Beach umbrellas feature either a wood or aluminum pole with a pointed pole bottom. The pointed end makes it easy to install deep into the sand. 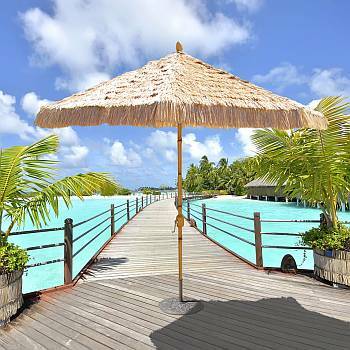 Wooden poles and fiberglass ribs beach umbrellas are usually best suited for the beach. - is the most traditional material used. Made of Teak, Ash and many other hardwoods. Wood is rustic, natural and a beautiful choice for most uses. 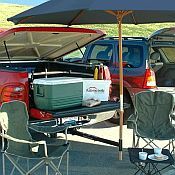 - Extruded sluminum poles and ribs make for lightweight and durable frame choice. They are usually powder coated and all kinds of colors and finishes and are better suited in more humid climates. - Typically this is used on the ribs that spread out the canopy when open. When an umbrella is open and is overturned by a wind burst, wood ribs will break and aluminum can bend. Fiberglass ribs easily flex to spill then winds energy and tend to be a more forgiving choice. This is more suitable for higher wind areas like coastal reagions. Fiberglass is also used over an aluminum pole to give it more strength and/or a texture, like to mimick a bamboo stalk. - Crank to Open and Push up manually and hold in place with a pin are the most common. Push Up is better in commercial or public places as crank open umbrellas can be cranked too hard and breaks the cable. 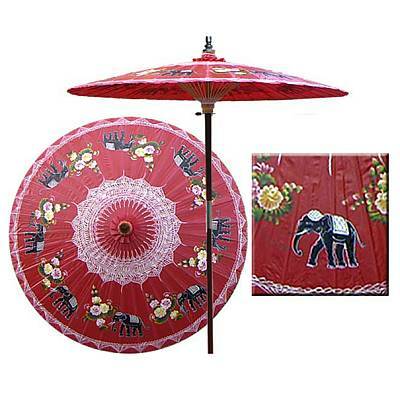 - Sunbrella is by far the most chosen fabric. It comes in a bunch of fabric styles, colors, resists fading, mold and mildew and has a much longer useful life outdoors. 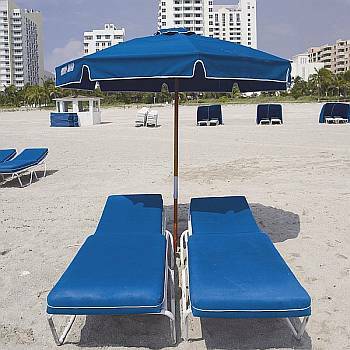 Olefin, Outdura, Nylon and others are chosen as a more economical canopy choice, but need to be replaced 2-3x more often over the umbrellas' lifespan. 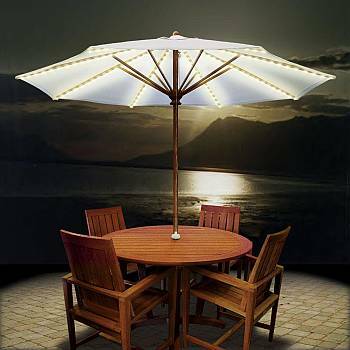 - Many aluminum frame umbrellas have models that come with built in LED Lights on the ribs. Most are low voltage for safety purposes and some are solar powered. - Even this old product has been effected by the adding of Bluetooth / WiFi speakers that can pair with your smartphone or other compatible devices. 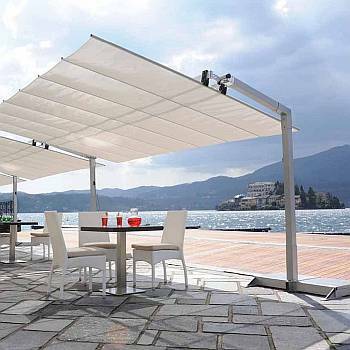 Find other Outdoor Patio Shading Solutions.